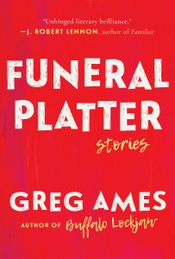 The following is from Greg Ames' collection, Funeral Platter. 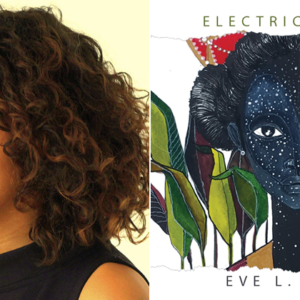 This collection of darkly humorous short stories is packed with moments of violence and tenderness and explores the humor and unease of modern life. Greg Ames is the author of Buffalo Lockjaw, a novel that won a NAIBA Book of the Year Award. His work has appeared in Best American Nonrequired Reading, Southern Review, McSweeney’s and more. Here’s what I know: life is short and life is long. Allow me to explain. But life is long, too, and no sudden changes need to be made yet. We must remain strong, angel. This might seem shocking coming from a thirteen-year-old, but I assure you I have given this ample thought. I understand all the obstacles. You’re married for one thing, and if I remember correctly you have two daughters, Kelly and Kim (? ), and a son named Jake in the military. And I have not yet embarked on my high school career. In the coming four years I will have quite a bit of homework to do, not to mention chores, and my mother has imposed upon me a strict ten o’clock curfew. Believe me, I have tried to sway her with all my considerable powers of charm and rhetoric. She is a rock, unmovable. “Give it a rest, buster,” she says. “You better be in by ten or no TV.” It is an effective hardline position. The good news is you work afternoons, a choice two-to-five shift, and have I failed to mention how fetching you look in that reflective vest? I rarely, if ever, think of you as a “crossing guard.” You move like a dancer. You blow your whistle like one of the jazz greats we listened to and appreciated in Music Appreciation class. True, I am impulsive, and some say it is this quality that makes me charming, but I am also patient and caring. I need you to know that I care about you. Your husband is an aloof man with a tragic sense of fashion and a hurried air, but in him I recognize a worthy foe. He will not let you go without a struggle. He climbs in and out of his minivan with the nimble prowess of a linebacker, one who can both rush the passer and cover a halfback in the flat. And yet I cannot arrest my true feelings, lock them up in that dank prison called “repression,” and dump them overboard while nobody’s looking on the Staten Island ferry, like so much illegal medical waste. Maybe I’m not being clear. Lover, I understand the logistics of compromise. If, for now, we must share only eleven seconds together each day, as you shepherd me across the street, then so be it. We have had that time, and for that I should be grateful. If I were never to see you again, I would cherish the memory of our encounter yesterday, the way you spread your arms protectively, shielding me from oncoming traffic, as I bent once again over my untied lace. I have a confession: I loosened my laces beforehand, on Carroll Street, to have a few more seconds with you. Yesterday, when I looked up at you, the sun hovered over your shoulder, illuminating your dark hair, and exposed the silhouette of your neck. I fumbled with my shoelace. At that moment my hands were like lobster claws—not in shape, of course, or even color for that matter, but in their usefulness. They were useless! And when you said, “Hurry up, for Christ’s sake. What’s your problem, kid?” I nearly wept with joy. I knew, then, and forevermore, that I adored you. “Ever heard of Velcro?” you said with a laugh, and to me it was a line of poetry more arresting than anything we read this term in pre-AP English. Ever / heard of / Velcro? You will not hear me say these words, of course, because I’ll be like three hundred feet away, at least, and I’ll probably only mouth the words anyway, because it would be lame to say them aloud and my cool high school friends would totally mock me, but know that I have said and meant them. Remember me, angel. To you, I was probably one of hundreds, maybe thousands, just another face passing by your corner. But you are my only one. From FUNERAL PLATTER. Used with permission of Arcade Publishing. Copyright © 2017 by Greg Ames.